Varjo makes revolutionary VR/XR hardware and software that together are jumpstarting a new era in immersive computing – where real and digital worlds merge seamlessly in human-eye resolution. Varjo’s virtual and mixed reality devices will profoundly change the way professionals work, design and create. When we’re done, computers will look nothing like they do right now. In his talk, Urho Konttori will peek into the future on what it means for design to see things in true-to life virtual reality during design reviews and the whole design process. The next step in design will be a part of the paradigm shift in immersive computing. The ability to see your product in human-eye resolution VR while you are actually designing creates fundamentally different designs, whether you are designing a boat, airplane, car, architecture or cabling for a building. 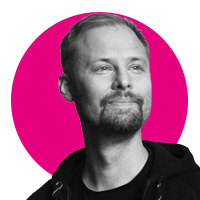 Urho Konttori is a product innovator and program manager with over 15 years of experience in designing, engineering and managing large-scale hardware and software projects at Microsoft and Nokia. He has been responsible for scouting, evaluating and defining high consumer value innovations such as novel cameras, see-through touch-screen fingerprint and VR headset technologies in more than a dozen mobile products, resulting in over 10 patents. He has also led the development of multiple operating systems, including the Linux-based Nokia N9 and N900 OS. Urho holds a B.Sc. degree in Algorithms.